Most thermoplastic road markings on local authority highway networks will be applied in the manner described on this page. Providing it is performed correctly, with good quality materials it is a highly successful and proven process. However I will make the comment that the bidding for local authority road marking contracts, and subsequent sub-contracting is very competitive, little testing of these road markings takes place, and it is my opinion that the standard of the finished road marking generally is not what it should be. 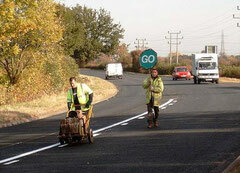 But standards of the road marking will vary throughout the UK according to contractor and the vigilance of the Engineer, whether working directly for the local authority or the consulting engineer / contractor who is contracted to undertake, and be responsible for, the highways maintenance work of the employing authority. The apparatus in the photograph may seem rather basic, but let me assure you that this machine, in the hands of a skilled operator, will produce excellent road markings that will comply with most contract documents. That is, providing a well formulated thermoplastic material has been used at the correct temperature, and the correct amount of good quality glass beads have been applied to the still molten surface. 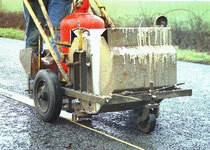 This equipment is used for the bulk of thermoplastic road marking for local authority networks, because it is relatively cheap, basic in function and robust, i.e. nothing complicated to go wrong, and it is easy to maintain. This procedure, correctly performed, will ensure a durable marking that has good initial retro-reflectivity which should be retained during the life of the line as the traffic slowly abrades the line surface exposing the glass beads incorporated in the thermoplastic mixture. 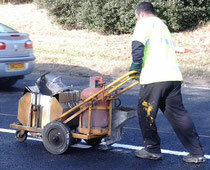 It really is not that difficult to produce good quality road markings providing the contractor uses good thermoplastic product, well maintained machinery and correctly trained operators. The factor that is outside the control of everybody is the weather, but if the weather is unsuitable then road marking should not be taking place. The hopper at the back contains the glass beads. The glass beads are discharged from the hopper on to a flat plate that spreads the beads to the width of the line. The flow of beads is adjusted to a rate to achieve the initial retro-reflectivity requirement stated in the contract document. It is not uncommon to state a rate of beads as 70% of the amount that would be required to achieve shoulder to shoulder cover when tested in the laboratory. But less than this amount may achieve the required retro-reflectivity stated in a performance based specification. The element that is critical is that the glass beads must be applied to the surface of the screeded thermoplastic while it is still in a molten state to ensure that the beads will form a firm bond with the thermoplastic. 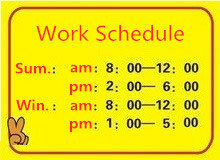 There are various "coatings" that can be applied to the glass beads in manufacture to improve the bonding process.